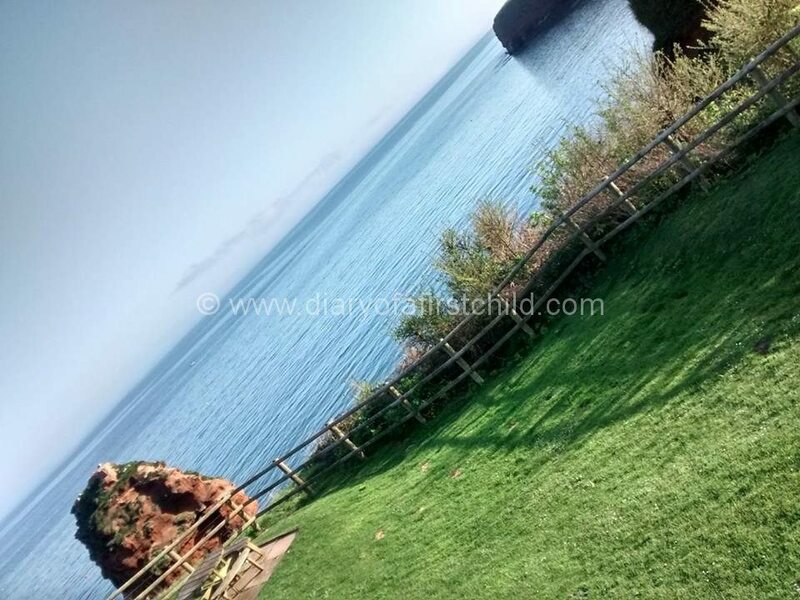 Last week my family and I had the amazing fortune of being in Ladram Bay, in Devon on England’s South Coast. I say amazing fortune because the weather was incredible. Our first two days there were shrouded in mist and the final four were beautiful sunshine, so we got to experience the best of both climates. From the moment you enter the park and head down the hill, your breath is taken away. You enter the park at the top of a mountain, and it’s downhill all the way to the cliff edge, where there’s a wedge that leads to the sea. I think you’d have rotten luck to not have a single glimpse of the ocean from your caravan, as they’re all on a slope. We were in the front row, with a balcony and it was the most beautiful view to wake up to and have dinner to in the evening. To one side you have high open fields, to the other a beautiful cliff face and in front the ocean. There’s nothing not to love. They’ve had a huge renovation recently, so when I was chatting to regular visitors they were saying that some of the facilities, like the new mini golf area, weren’t even finished two weeks before our visit. The gym was still under construction during our visit, and they were extending the balcony on the restaurant so that more patrons can enjoy those amazing views I mentioned above. The swimming pool is fantastic, clean and with a squishy ‘bladder’ that I’m sure helps insulate and keep it warm too. It’s the first holiday park heated pool I’ve been in that’s actually been warm enough to swim in, even in cold weather. The showers, sauna and steam room are almost spa-like in their appearance – you certainly don’t feel like you’re in a state run swimming pool. Add a dash of aroma therapy to the steam room or some sandalwood to the sauna and you’d think you were in a spa. There is so much to do. After previous visits to holiday parks, I’ve learnt to pack a craft box, some story books, a few DVD’s. On this trip, in six days, we didn’t even open the Trunki. There wasn’t a gap where we had nothing to do – unless what we were doing was nothing, by choice. And we didn’t even get to do everything. 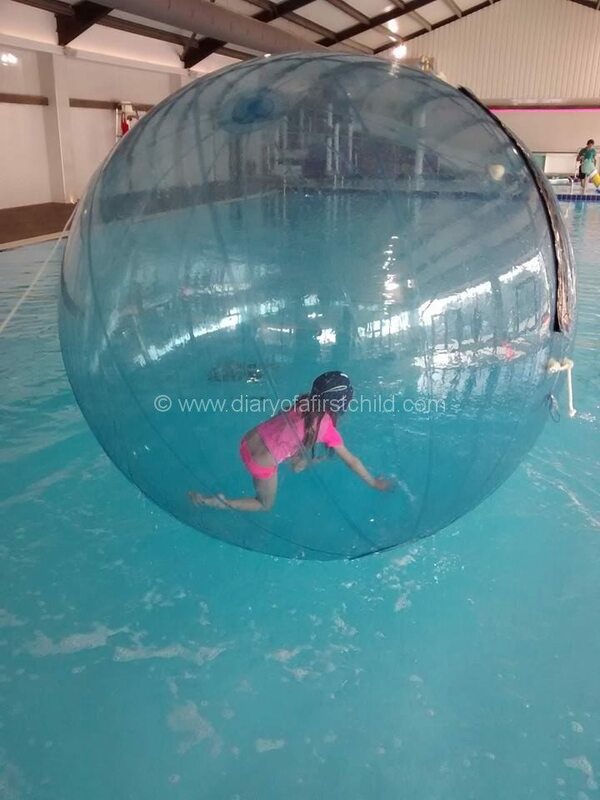 The pool is almost Olympic sized with a bubble section on one side. It also has a brand new kids play area, with toppling water buckets, a water feature, spraying worm, slide for smalls and larger slides for kids of all ages, or just kids at heart. 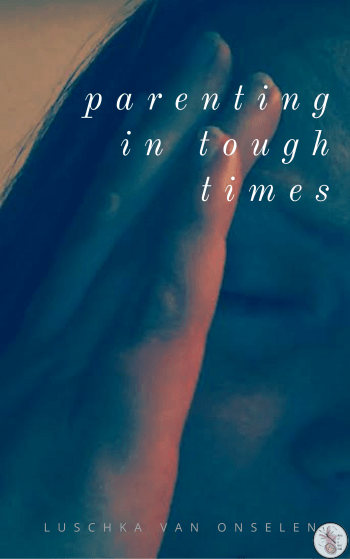 I’ve already mentioned this, but for tired and worn out parents, it’s worth a separate mention. There’s a sauna and a spa and they don’t allow children under 17 in them. Yayness. I still think they could add a few drops of essential oil and turn it into a spa experience, but it’s not billed as a spa, so fair enough. 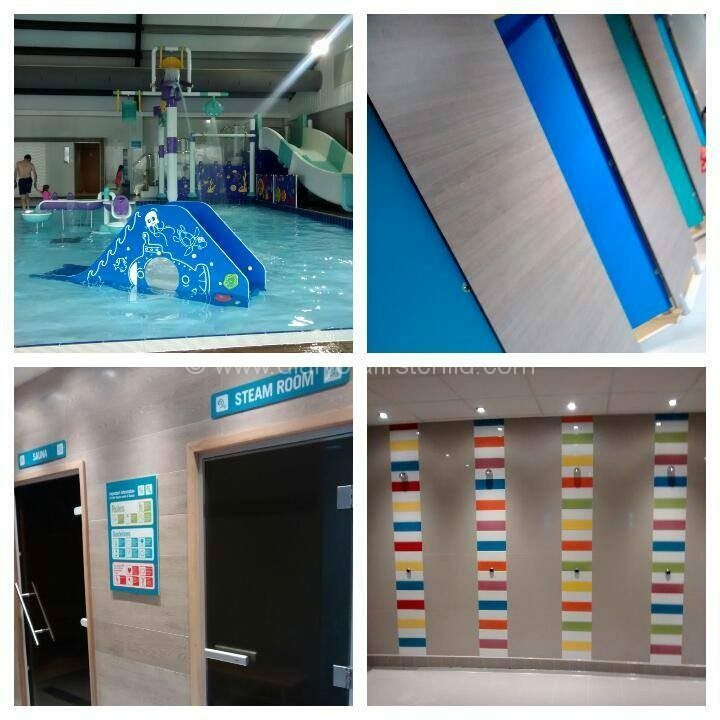 and an adventure play area, arcade area, soft play & mini golf…. The adventure play area is something we meant to get to, but never quite made it to. There’s a pirate ship, a zip wire, swings and more. There were pretty much always children in that park! There’s a games arcade and a small soft play are and dinosaur themed mini golf too. I found the arcade a little pricey, but it’s not their fault I can’t stop once I’ve set my mind on a specific number of tickets! 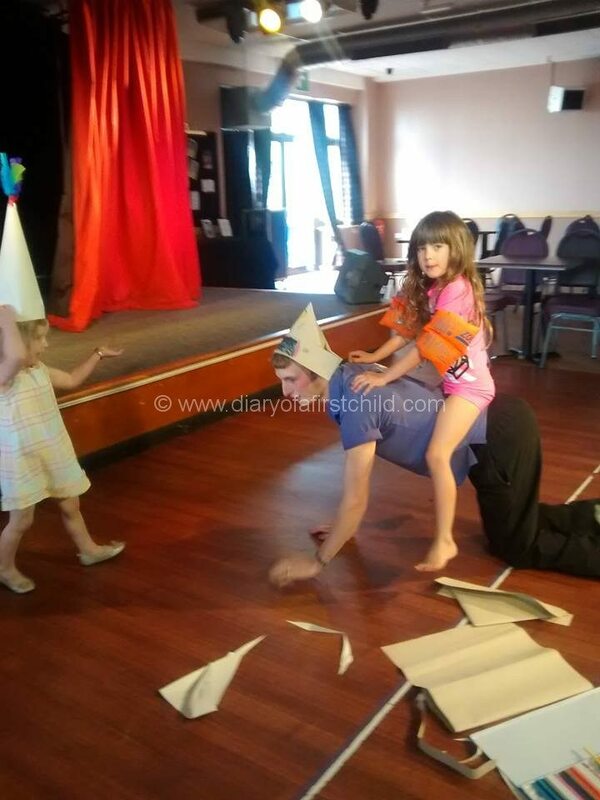 The highlight of ‘things to do’ at Ladram Bay, however is the activities. 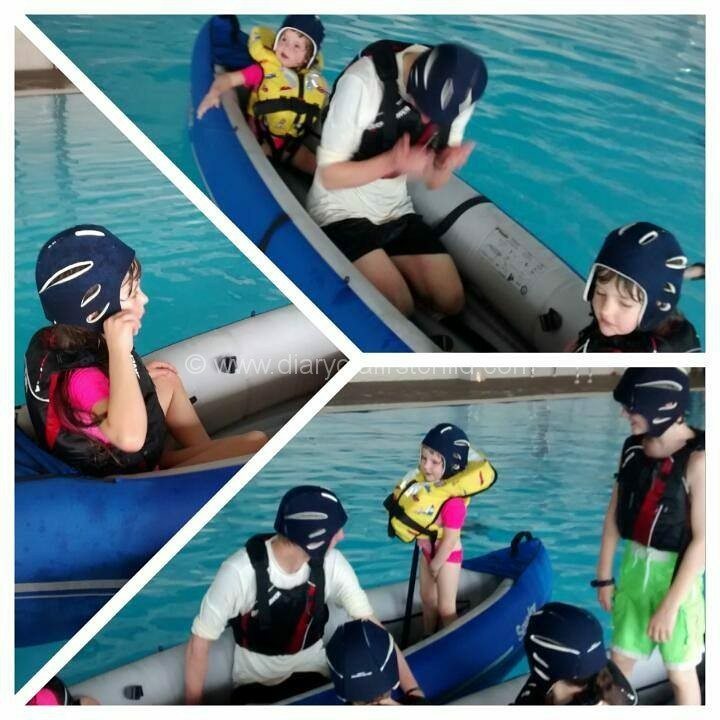 Between the paid for activities run by the Start Team (and by paid for, I mean around £3.50 an activity, not near £10 like a place we visited last year!) 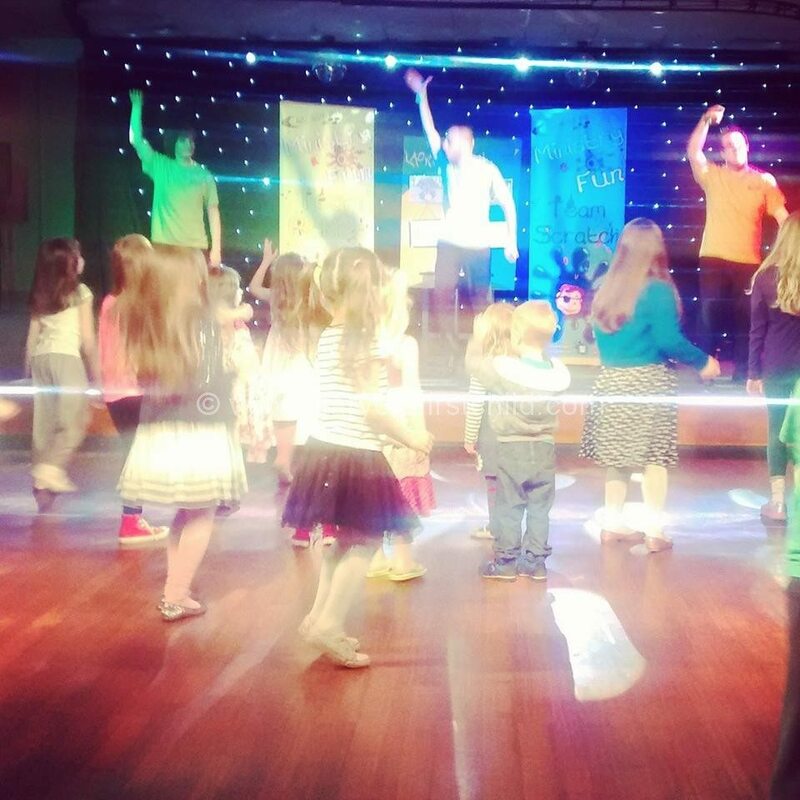 and the free activities run by Ozzie’s Crew (the Greencoats) there was never a shortage of something to do. The only way I can really describe the people running these activities is by saying that they were born for these jobs. They were so engaged with the children. They made you feel like you wanted to be there, they wanted you to be there and more importantly, they wanted to be there. They very quickly got to know the children’s names, and used them. They went above and beyond with entertaining the kids, even if we happened on a member of the teams on their lunch breaks. I can’t speak for all the caravans, but we were blown away by the one we were in. It had more storage space than our house does (I’m not kidding. We have no cupboards.) It is well stocked – I brought a sieve and funnel for my Kefir, but that’s not something most people take on holiday – with everything you need for self-catering, had a microwave, oven, stove and large fridge and freezer (again, more than we have at home!). There was even an airing cupboard (I know you’re imagining my house right now, but yup, we don’t have one of those at home right now either!) Oh, then there’s plenty sofa space, and a fire place (my house is starting to sound positively grim now – it’s not really), and a balcony with outdoor seating. On and not one, but two toilets. The kids were stunned by this luxury! The beds were comfortable, the linen was cotton and pleasant, and the heating was really useful for the first two days once we figured it out. There’s a reason my two year old wants to go back to the caravan instead of being at home! Oh and a decent sized TV with what I think was Freeview channels. 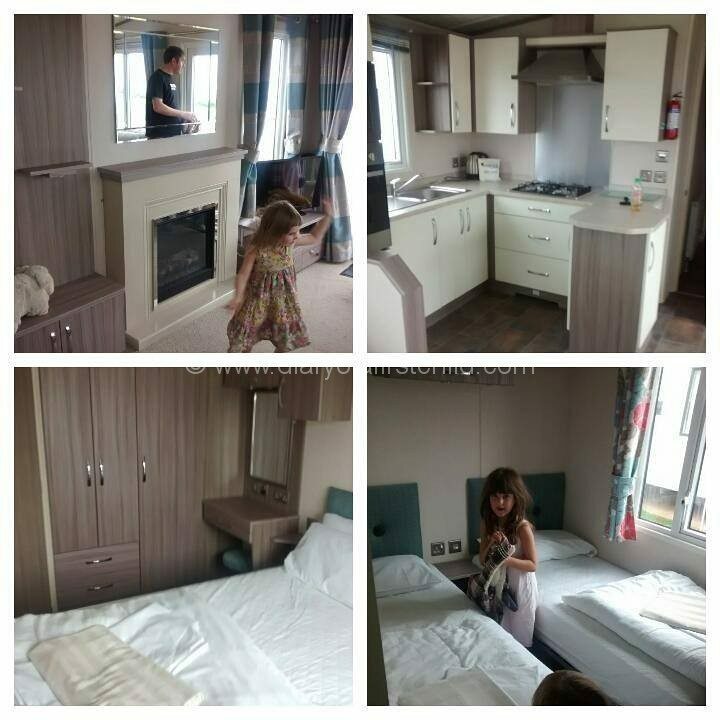 Ladram Bay offers a choice of accommodations, so a large party can sleep in the luxury cabins, or a group of four can have a budget caravan. You can have a caravan with or without a balcony, or with a jacuzzi on the balcony. Or a touring caravan pitch if that’s your thing. There’s a vast range of choice and related price options. You can use the facilities whether you’re there in a camper van for a night or a static van for six months. I love the beach, but I don’t like lying on it in the sun, so for me having variety is a bonus. There’s a forest you can climb up the mountain to, there’s a mountain you can climb, and there is a beach. I think it’s wonderful having a variety of options so you can please everyone. I took the children rockpooling while my husband climbed the mountain – we were all happy! You know we love our National Trust #50things campaign, and on this trip we ticked off explore a cave, hold a scary beast, discover the creatures in a rockpool, and build a raft and you could also do a few others, like canoe down a river except it would be the sea or if you’re small like mine, the pool. I asked a few of the staff what made working there good, and they all said the management really look after them. For example, when they designed the kitchen they specifically opened it up so that the chefs could still enjoy the view rather than being stuck in a windowless box all day. I think that’s awesome. I’ve mentioned how good they are with the children before, but I was really struck by how good they were in looking after everyone. Even if there were just the three of us in the pool, there were three life guards on duty – and they all seem to rotate position every 15 minutes or so to keep fresh, I suppose. When the pool was really full and the sauna and steam room were being over run by a group of about 20 15 year old boys, it didn’t take long for one of the life guards to stick his head in and make sure all the under 17’s were out quickly. No one is left to run riot, so the holiday isn’t ruined for everyone. I love that. We’ve all bought over priced, terrible food. We accept stale chips, dry burgers and limp lettuce as part of holiday park food. You don’t get that here. We didn’t eat from the take away, but we did visit Pebbles Restaurant twice – read the full review here – and the food was amazing. The children’s options were what I would call standard, and not overly exciting, but the rest of the menu is fantastic. I had the most amazing, locally sourced rib eye steak with melt in your mouth dauphinoise potatoes. It was incredible. And that’s just one of the meals. If we were in the area and not at Ladram Bay, I’d still drop in for a meal! There’s a little shop on site that stocks pretty much everything you need, though we found the selection of nappies to be on the slim side. There was everything else though, especially if you’re camping and find yourself short of anything. There’s a fab range of food stuff, and fresh food, as well as freshly baked pastries and while they could charge whatever they want, really, we didn’t find the prices to be over the top – it certainly wasn’t worth driving the 15 minutes to Exmouth instead. You can also send and receive mail from the Reception if you need to. There’s communal internet in the Waves Bar, but that was down for two days. There’s also an option to pay for wifi in your caravan. At £20 for one week, it isn’t ‘cheap’ and it didn’t always work well. Vodafone doesn’t get signal all the time, but EE was fine for syncing my laptop to a phone internet. My advice: unless you’re like me and have to work even on holiday, embrace it. Leave the phone and enjoy the time with your family. Forget about the internet. Just spend time. One ice cream or one a day, restaurant dinner once or daily, activities once or daily, it’s all up to you. You don’t have to spend more money than you would do at home. Between the beach, pool, soft play, adventure play ground and taking your own bat and ball onto the lawn area, you don’t have to spend money. It’s not like you’re being milked dry at every corner. Cook in the caravan, eat at the restaurant, grab a takeaway, it’s up to you. Pay for activities, do the free activities, your call. The site is family owned, and has been for 70 years. They have an allocation of Hoseasons caravans which allows them to ‘compete’ for awards, but for the rest Ladram Bay is family owned and run, and you can feel it. While it has all the hallmarks of a UK caravan holiday site, it doesn’t feel like you’re in a corporate machine. If you want to leave the site, there’s so much to do in the area. From a historic fishing village called Beer to a fun family day out at World of Country Living you could not spend a single day on site, but that would be a waste – and that’s huge for me to say. 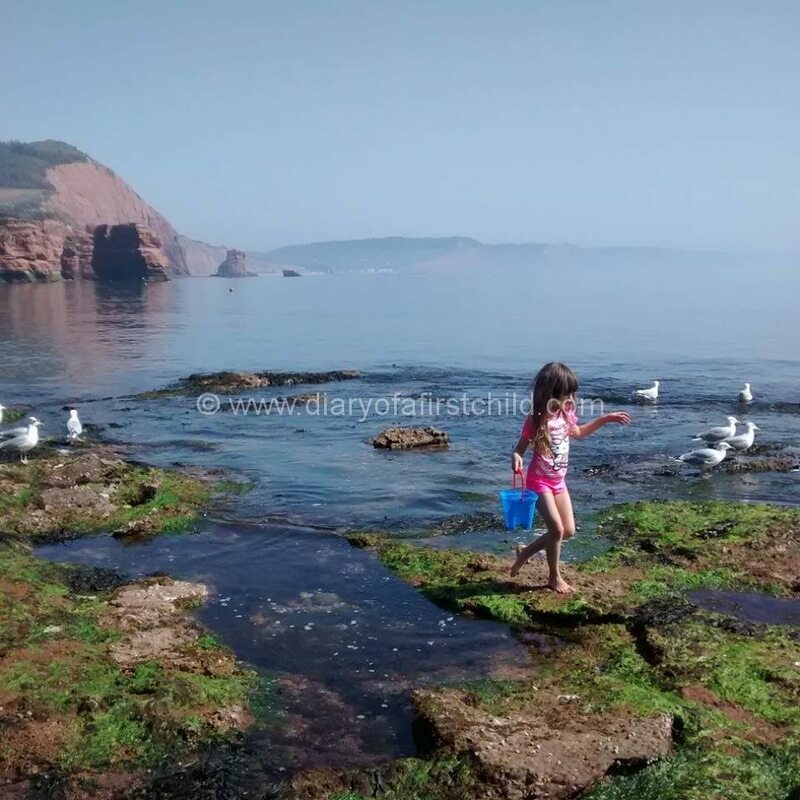 Normally I’m all about getting out and exploring, but we had so much fun and were so busy, and yet so relaxed at Ladram Bay we didn’t even want to go off site and even extended our holiday for an extra day – both brand new experiences for us! To be fair and balanced, I should add a negative, so one thing I would like to see more of is a focus on local food in the shop. The owners of the site also own a butchery, I think, so having a ‘Devon Local Food’ section would be nice. The fresh meat in the shop is delicious, but it could be from anywhere. You can buy local chutney, jam and mustard in the shop too, but again some local produce and local specialities (cheese, for example) would be nice for foodies like me. It would probably just require a change in marketing, rather than produce! So those are our reasons to visit Ladram Bay. We hope to be back again soon and would love to see you there! 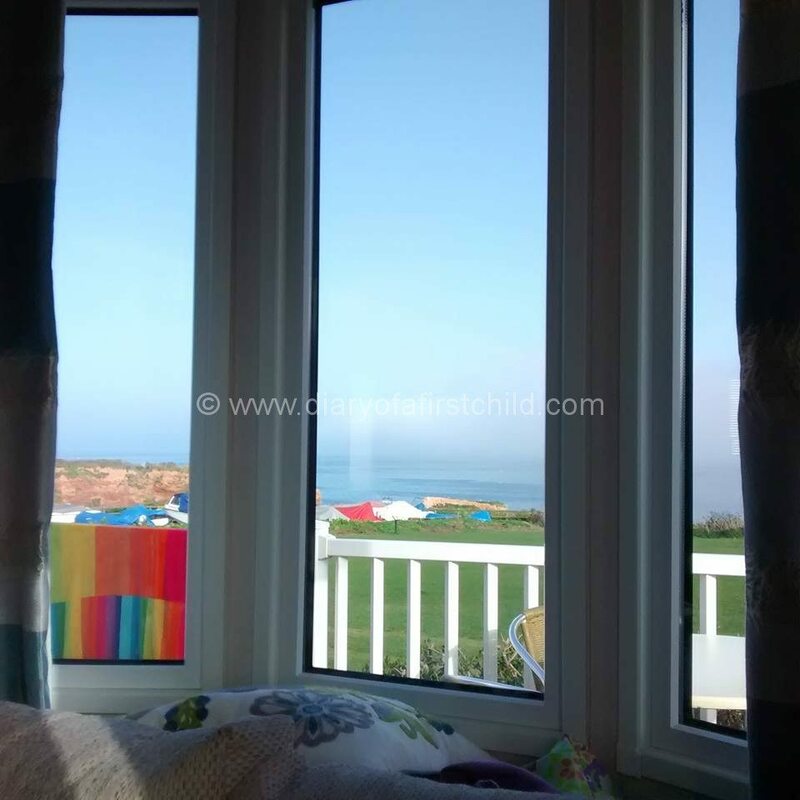 We were given four nights at Ladram Bay for review. Thoughts and opinions were entirely our own.